If Dr. Danielle had her way, the smiles of her young patients would stay perfectly safe and healthy throughout the course of their lives. Sadly, teeth are susceptible to damage and tooth decay at any age – that’s why quality restorative care is so important. At Pediatric Dentistry of Prospect, our team will make every effort to catch these kinds of problems at the earliest stages possible during routine check-ups and cleanings, keeping any necessary treatment as minor and minimally invasive as possible. As your little one grows, we’ll also provide fun and friendly instructions for how to brush and floss properly so that they can care for their precious smile at home. How do I know if my child needs restorative dentistry? Your child’s teeth look deeply discolored from their natural white shade. This often means that the enamel has experienced damage. White patches have appeared on your child’s smile. This is another common sign of issues with the enamel. Your child consistently complains about tooth pain, especially when eating foods that are overly hot, cold, or sugary in nature. 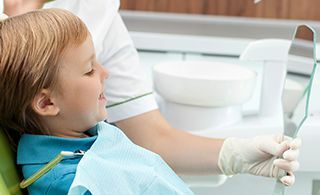 Here in Prospect, KY, Dr. Danielle offers dental fillings to treat tooth decay, and sedation dentistry is available as well to help your child remain calm, relaxed, and pain-free throughout their treatment. We see babies, adolescents, teenagers, and patients of all ages with special needs –don’t hesitate to contact us today and schedule your child’s first appointment! We look forward to giving them reasons to smile and helping them form a positive relationship with dental care in our nurturing office environment. Our practice is open to new patients from Beachland Beach and other nearby areas.